Posted on April 30, 2007 by Kathy T.
Great calendar online for Cedar Grove here. If we get more updates, we’ll post the dates here. The density of housing in La Vergne was the topic of an article published this morning in the Daily News Journal. According to the fire chief, because homes are allowed to be built 20 feet apart, firefighters can sometimes not get between them because of the intensity of the heat and flame to keep the fire from spreading. This was the case last week. On a positive note, the city planning commission did change the minimum square feet from 5 feet p/house (making for a 10 foot separation) to 10 feet (thus a 20 foot separation) several years ago. I would suggest the planning commission consider passing a 15 foot separation, but I really think that train has already left the station. However, I do think we already have plenty of high density housing and while this is sadly just a pipe dream, maybe the city should now consider only medium or low density housing in new construction. On a related topic, Rutherford County is doubling the cost of new building permits, effective tomorrow. The higher fees will help pay for staff operations. 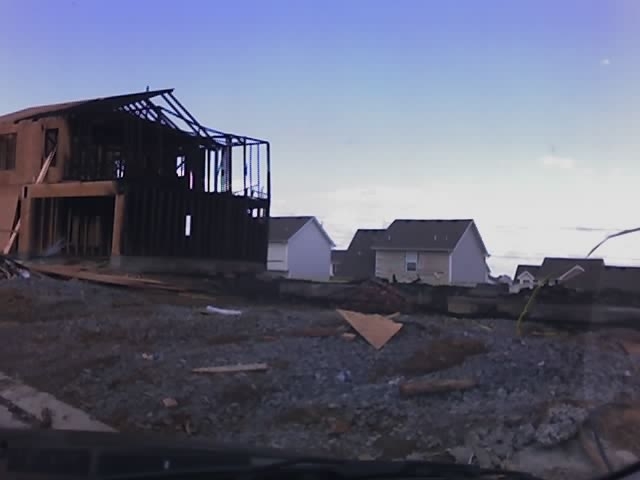 Of course, buyers will almost certainly have the cost passed to them in the final price of the home, but I believe Ivy proposed higher costs of building permits in La Vergne for this very reason… to help fund more police officers, fire fighters, or at least better salaries for our current officers. Watch for home sale numbers later this week for April 2007. Posted on April 29, 2007 by Kathy T.
Hello La Vergne. I received a comment from a native La Vergne’ite (or is it La Vergner) asking for help in locating her birth family. As I have only lived here since 2003, I’m putting this out there for help. As always, remove the Z’s which have been placed to fool the mangy, smelly spammers. I’m not sure if Barbara’s birth name is Francis, but if anyone knows these folks, please let us know so we can share with Barbara. Many thanks. Lazy Donkey La Vergne is open! Just wanted to pass the word along that the Lazy Donkey in the Waldron South Plaza shopping center has opened! My daughter & I saw that the parking lot was full and the lights were on, so we decided to stop in and have dinner. It was kind of amusing, because you could definitely tell it was their very first night open, and they seemed a bit surprised at the response. I attempted to order a margarita, and was told that they do not have their liquor license quite yet. They should have it by next Wednesday, the manager said. She told me that they were not really supposed to open this soon, but they decided to “turn on the lights and see what happened.” We shared a laugh after I told her that she didn’t have to wonder any longer how much their opening had been anticipated, because they were packed! As with any “opening night,” there were still a few kinks to work out. The food was very good, and beer is available. The decor is attractive, but I hope they will dim the lighting just a bit, because it was very bright for a sit-down restaurant. The deck is perfect for the upcoming summer season. I am looking forward to spending a lot of time out there! Waldron South Plaza is such a welcome addition to the North side of I-24. With the crowd that showed up tonight just from passing by, I can already tell that this restaurant and shopping center is going to be a huge success! Posted on April 26, 2007 by Kathy T.
Update 7:51 a.m., 4-28-07: DNJ Reporter Mealand Ragland-Hudgins has a nice write up from yesterday’s press conference. Read it here. Also reader Michael gave us a link to Metro’s police salaries. Thank you for the statistics – definitely something to consider at the May 3rd budget meeting (1:00 p.m. City Hall). Found out during an afternoon press conference, that the Police Department has some extra patrols in Lake Forest, not only in cars but on ATVs and on foot. So hopefully, that’s going to ease the minds of some of the residents out there. Also a friend at the press conference called to tell me she learned that the police do not suspect that the fire was gang related. That is, NOT gang related. It sounds to me like it was just some dumb kid out making trouble. Here’s a picture I took this afternoon when I was in the neighborhood showing homes. If the quality is bad, it’s because it’s from a camera phone. Check with Lt. Ruch (Rue) at the Police Department (793-7744) to see how to go about starting neighborhood watch. He can help you set one up. It’s up to the citizens to keep it going. It’s a start. I know the cops are patrolling as much as they can, but they do have to patrol the rest of the city as well (they are assigned to zones). You can’t patrol half the city (Lake Forest, etc.) and ignore the other half. We have crime in my area of town as well, so I’m hopinh they continue to patrol my neighborhood as well. I think it all comes back to us working as a community to help out our police officers, our fire fighters, and each other. When we have each others backs, then we are more likely to help decrease crime. This is a good time to remind everyone that the city is planning events for the National Night Out Against Crime, which will be August 7th at 6:00 p.m. “View from the Lake” and I attended the first organizational meeting with Ms. Mayes, Lt. Ruch, and another gentleman whose name I didn’t catch, but who has volunteered for years with the event. There is a lot of work that goes into it, but the more help there is, the less work there is because the burden of all the planning will be evenly divided. The next planning meeting will take place on May 12 at 10 a.m. at the Parks and Rec Building, 294 Sand Hill Road in La Vergne. I plan to be there and I hope many more of you will also attend. Let’s move the city forward to show that we won’t stand for crime. Criminals will be caught, hauled to jail in Murfreesboro (nudge nudge wink wink), and prosecuted. I’ll post a reminder as the meeting date approaches, but meanwhile, please mark you calendars to attend! With all the jail talk this week at our blog, here’s a doozy. It’s a good thing this guy is still locked up because it’s in these instances that I think posses are not a bad idea. And I just want to say it’s when our police force capture freaks like this, you deserve every single penny of your salary and probably about $100,000 a year more! Gah. Posted on April 25, 2007 by Kathy T.
According to Channel 5-WTVF, a 14-year old has been arrested for theft, arson and burglary for the fire on Hectare Lane on April 1st. He apparently threw a Molotov cocktail in the home. 14 years old. Man. At first I thought the arrest was from Mondays fires, but re-read the article. Did I miss one on April 1st?